Team of three achieve 141 miles for charity. Left to Right Katie Fell, Vicky Jarman, Caitriona WoodUK based printMAX showed its true colours on Saturday 9th March when three members of the team donned their cycling shorts for Comic Relief. Marketing manager, Vicky Jarman and consumables consultants Caitriona Wood and Katie Fell cycled a total of 141 miles for charity. Between the three of them they managed to cycle the total distance from their offices in Selborne, Hampshire to Birmingham’s NEC, which is the location of the annual Sign and Digital UK. The exhibition is the yearly highlight for Roland’s most successful authorised dealer printMAX who were keen to incorporate it into their fundraising efforts. The girls started their epic journey at 9am in a local gym, Energique, using three exercise bikes. It took the team took four hours to complete the ride. 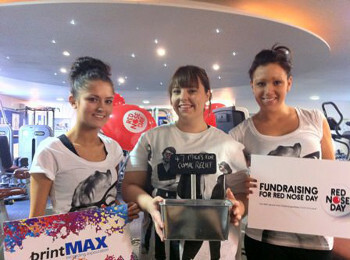 In total the printMAX girls raised £700 before gift aid, all of which is going towards the 25th year of fundraising for Comic Relief. Donations are still being welcomed at https://my.rednoseday.com/sponsor/printMAX you can also see the team at Sign and Digital UK at stand F30 April 30th – May 2nd.